Australia’s first peoples have painted rock shelters like these for at least 35,000 years, though this activity was discontinued during the stresses of the LGM. Photo: P.S.C. 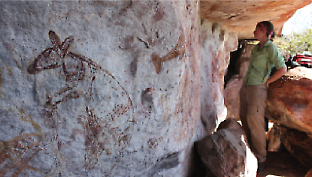 Taçon with permission of Ronald Lamilami and the Aboriginal people of the Namunidjbuk Estate, Wellington Range, Arnhem Land. New research reveals how Australia’s ancient Aboriginal populations were challenged by extreme climate change between 23,000 and 12,000 years ago, and provides insights into how people may respond to dramatic climate change in the future.